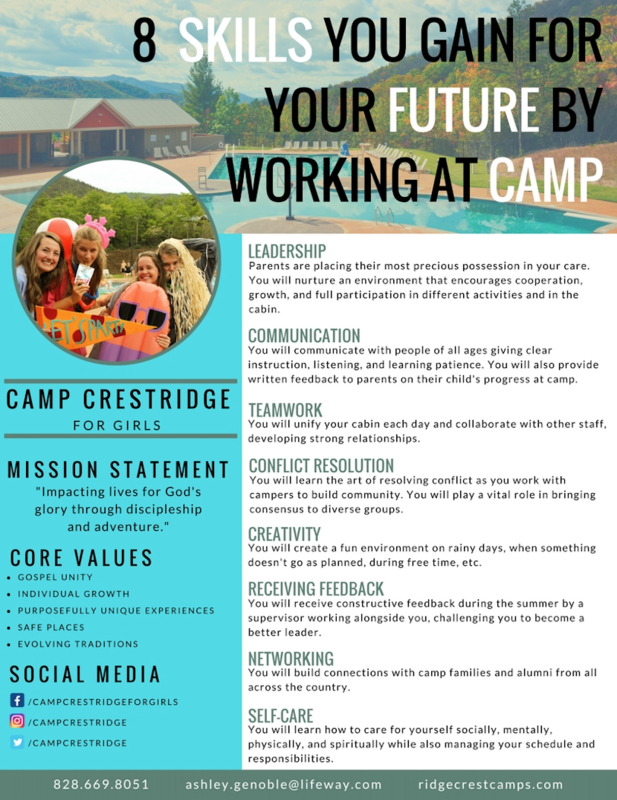 Why Work at Crestridge Christian Summer Camps? As you continue through college and work toward a career, you may ask yourself "Why should I spend a valuable summer at a camp?" You may also be weighing this experience against summer school, trips, or internships. We know the summer is critical to college students. This is why we believe there is no better way to spend your break than to be part of a Christian Camp ministry. The American Camp Association has talked with numerous employers throughout the world and points out that the camp experience shapes tomorrow's world leaders. By working at one of our camps, you are sure to gain skills that will equip you to be successful in any career you may choose. In fact, we encourage you to share this information in your next job interview! Learn more great reasons to work at camp by checking out our Benefits section. If you are already sold, click Apply Now to start your application!